Measurement Units: "dB" and "dBm"
Whenever tests are performed on fiber optic networks, the results are displayed on a meter readout in “dB.” Optical loss is measured in “dB” which is a relative measurement, while optical power is measured in “dBm,” which is relative to 1mw optical power Loss is a negative number (like –3.2 dB) while power measurements can be either positive (greater than the reference) or negative (less than the reference.) Should a meter be set for dB or dBm? Confused? Many fiber optic techs are too. Let’s see if we can clear up some of the confusion. When we make fiber optic measurements, we are measuring the power in the light coming out of the end of a fiber. The primary calibration standards we use for power measurements, maintained by NIST (the US National Institute of Standards and Technology,) are actually determined by the heating effect of the power of the light as it is absorbed in a detector. Every fiber optic power meter sold is calibrated traceable to the NIST standard in the US or similar primary standards worldwide so different meters should measure the same power, within the limits of calibration uncertainty. Optical power in fiber optics is similar to the heating power of a light bulb, just at much lower power levels. While a light bulb may put out 100 watts, most fiber optic sources are in the milliwatt range (0.001 watts), so you won’t feel the power coming out of a fiber and it’s generally not harmful. (Except for DWDM systems with fiber amplifiers or lasers used for surgery or welding. DWDM systems with fiber amplifiers can carry enough power to pit the fiber end or even ignite cables if a fiber in cracked!) Remember you can't see this light either because it is in the infrared wavelengths beyond the sensitivity of the human eye. Read more on optical power measurements. In the very early days of fiber optics, source output power was usually measured in milliwatts and loss was calculated in dB or deciBels. Over the years, all measurements migrated to dB for convenience. This was when the confusion began. Loss measurements were generally measured in dB since dB is a ratio of two power levels, one of which is considered the reference value - that's "0 dB" for loss measurements. dB is a logarithmic scale (remember “logs” from high school math?) where each 10 dB represents a ratio of 10 times. dB = 10 log (measured power / reference power). Using this equation, 10 dB is a ratio of 10 times (either 10 times as much or one-tenth as much), 20 dB is a ratio of 100, 30 dB is a ratio of 1000, etc. When the two optical powers compared are equal, dB = 0, a result of the log scale used in dB but a convenient value that’s easily remembered. Compare the positive and negative dB across the rows. The ratio of the positive dB is the inverse of the negative dB, e.g. +10dB is a ratio of 10 times and -10 dB is a ratio of 1/10 or 0.1. Thus 10 dB is a ratio of 10 times: +10 dB means the power measured is 10 times greater than the reference power and -10 dB is one-tenth as much. Some of the numbers are easy to remember and may be useful. For example, +3 dB is a factor of two in power and -3 dB is a factor of one-half. When the two optical powers compared are equal, dB = 0, a convenient value that is easily remembered. If the measured power is higher than the reference power, dB will be a positive number, but if it is lower than the reference power, it will be negative. Thus measurements of loss are expressed as negative numbers. Here is an Excel spreadsheet that calculates dB/power ratio and dBm/milliwatts. Measurements of optical power are expressed in units of dBm. The “m” in dBm refers to the reference power which is 1 milliwatt. Thus a source with a power level of 0 dBm has a power of 1 milliwatt. Likewise, -10 dBm is 0.1 milliwatt and +10 dBm is 10 milliwatts. Fiber optic sources may vary from -20dBm to +20dBm and receiver power may go as low as -40dBm. That's not hard to remember. 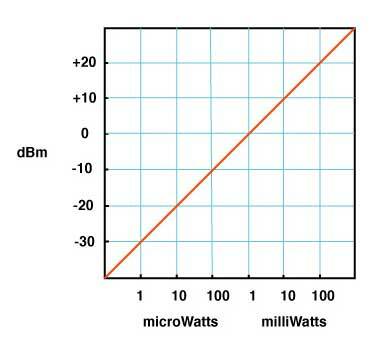 Positive dBm means power greater than 1mw and negative means less than 1mw. A good laser source for a singlemode link will have a power output of ~ +3 to +6 dBm - 2-4mw - coupled into the fiber. A VCSEL for multimode links should have a power around 0dBm - 1mw. And a LED, used in older multimode links, has a typical power of -10 dBm - 0.1mw or 100microwatts. If we have loss in a fiber optic system, the measured power is less than the reference power, so the ratio of measured power to reference power is less than 1 and the log is negative, making dB a negative number. When we set the reference value, the meter reads “0 dB” because the reference value we set and the value the meter is measuring is the same. Then when we measure loss, the power measured is less, so the meter will read “ – 3.0 dB” for example, if the tested power is half the reference value. Although meters measure a negative number for loss, convention has us saying the loss is a positive number, so we say the loss is 3.0 dB when the meter reads – 3.0 dB. Here is a short movie of what happens when we induce loss in a cable by stressing it and watch the display of a power meter. We start at -20.0dBm and after stress is added to the cable to cause loss, the power level goes down to -22.3dBm, showing our stress on the cable caused 2.3dB loss. Look at this animated simulation of a laser/singlemode system with 1mw power from the source and watch the meter reading. Watch carefully as the transmitter couples a signal into the fiber. As the signal pulse travels down the fiber, it is attenuated by the fiber, suffers more loss in the connection, then is attenuated more until it reaches the receiver. See how the power in the signal decreases as it travels down the fiber, becoming more negative when measured in dBm. Note: If you are used to making measurements of loss with a light source and power meter, you are used to loss being a negative number. But some manufacturers of optical loss test sets, which include a source and meter, show dB loss as a positive number. They were probably confused by the fact that everybody says "the loss is X dB" not "the loss is -X dB. And they never looked at the math. Or learned math. Instruments that measure in dB can be either optical power meters or optical loss test sets (OLTS). The optical power meter usually reads in dBm for power measurements or dB with respect to a user-set reference value for loss. While most power meters have ranges of +3 to –50 dBm, most sources are in the range of 0 to –10 dBm for lasers and –10 to –20 dBm for LEDs. Only lasers used in CATV or long-haul telephone systems with fiber amplifiers have powers high enough to be really dangerous, up to +20 dBm – that’s 100 milliwatts or a tenth of a watt! The OLTS or the power meter on the dB scale measures relative power or loss with respect to the reference level set by the user. The range they measure will be determined by the output power of the source in the unit and the sensitivity of the detector. For multimode fiber, an OLTS using a LED source will usually measure over a range of 0-30 dB, more than adequate for most multimode cable plants which are under 10 dB loss. Singlemode networks use lasers and may have loss ranges of up to 30-40 dB for long-haul telecom systems, but campus cabling using singlemode may only have 1-3 dB loss. Thus a singlemode OLTS may be different for short and long systems. Read more on fiber optic instruments. If you remember that dB is for measuring loss, dBm is for measuring power and the more negative a number is, the higher the loss, it’s hard to go wrong. Set your zero before measuring loss and check it occasionally while making measurements. More on calibration and metrology (the science of measurements) in fiber optics.